The significant increase in high deductible insurance plans – the average deductible for employer-based plans reached $1,500 in 20182 and the average deductible for individual Aﬀordable Care Act (ACA) Bronze plans was more than $5,800 in 20183 – is driving the need for billing companies to become specialists in patient collections. Of those surveyed, patient balances account for an average of 23% of total collections. Billing companies that have traditionally charged a lower rate for patient collections now have the opportunity to align their fees with the changing reality of their work models. 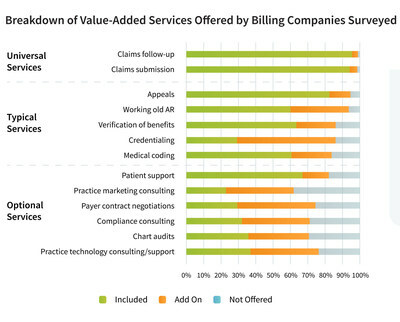 Kareo is the only cloud-based and complete medical technology platform purpose-built to meet the unique needs of independent practices and billing companies. Today Kareo helps over 1,600 billing companies and 50,000 providers across all 50 states run a more efficient and profitable business, while setting them up to deliver outstanding patient care. Kareo has received extensive industry recognition, including the Deloitte Technology Fast 500, Inc. 5000, and Black Book's #1 Integrated EHR, Practice Management and Medical Billing vendor, as well as ranking at the top of the Leader Quadrant in the FrontRunners Software Analysis of EHR. Kareo's growth further demonstrates the expansion and vitality of the independent practice market in the U.S. With oﬀices across the country, Kareo's mission is to help independent practices – and the billing companies that support them – succeed in an ever-changing healthcare market. More information can be found at www.kareo.com.